The moderate hypercapnia that occurs during most laparoscopic procedures using CO2 pneumoperitoneum is beneficial via a mild sympathetically mediated cardiostimulatory effect. However, the direct cardiodepressive effects of CO2 and the severe respiratory acidosis associated with hypercapnia of this magnitude can lead to cardiovascular collapse and/or fatal dysrhythmias if the level of PaCO2 exceeds 60 mmHg (132-134). FIGURE4 ■ Arterial tracing after rapid intravenous injection of 7.5 cc/kg CO2 (top) and helium (bottom) in a dog. There is recovery within one minute after the CO2 injection but complete cardiovascular collapse after the helium injection. Source: From Ref. 130. A diffusion limit of carbon monoxide measurement less than 50% of the predicted value is predictive of the inability to adequately eliminate CO2 during laparoscopy with CO2 pneumoperitoneum. In such patients, open surgery, alternative gases, or gasless laparoscopy should be considered. Spontaneous pneumomediastinum and pneumothorax may occur during laparoscopy without any evidence of diaphragmatic injury. Although usually with no clinical significance, they can inhibit cardiac filling and limit lung excursion. Fatality has been reported. Reduction of intra-abdominal pressure to the lowest pressure that allows acceptable exposure is prudent, facilitates CO2 elimination by reducing the interference of pneumoperitoneum with pulmonary mechanics, and reduces CO2 absorption. 6.7% of procedures had to be converted to open surgery because of hypercapnia (62), and similar conversion rates have been reported during urologic laparoscopy (49,135). Preoperative pulmonary assessment is recommended for patients with clinically significant pulmonary disease. A diffusion limit of carbon monoxide measurement less than 50% of the predicted value is predictive of the inability to adequately eliminate CO2 during laparoscopy with CO2 pneumoperitoneum (136). In such patients, open surgery, alternative gases, or gas-less laparoscopy should be considered. Patients with chronic obstructive pulmonary disease without such severe diffusion impairment can usually undergo laparoscopy without complication (137). Clinical studies have suggested that CO2 absorption is increased in the presence of subcutaneous emphysema (51,94,138), elevated intra-abdominal pressure (19), and increased duration of insufflation (38,46,78,112). Some authors have found extraperi-toneal insufflation to increase CO2 absorption (51,93,94), whereas others have not (95-97). As the anesthesiologist monitors the P(et)CO2, any worrisome elevation must be immediately reported to the operating surgeon. Often, just a brief period of desuffla-tion to eliminate the excess CO2 is all that is needed. 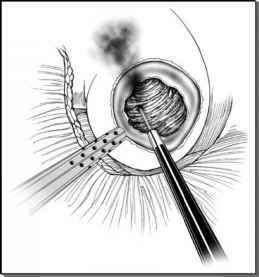 When laparoscopy is resumed, rapid ventilation should be continued. Reduction of intra-abdominal pressure to the lowest pressure that allows acceptable exposure is prudent, facilitates CO2 elimination by reducing the interference of pneumoperitoneum with pulmonary mechanics, and reduces CO2 absorption (19). If hypercapnia recurs, options include aborting the procedure entirely, converting to open surgery, or using alternative insufflants or gasless laparoscopy.